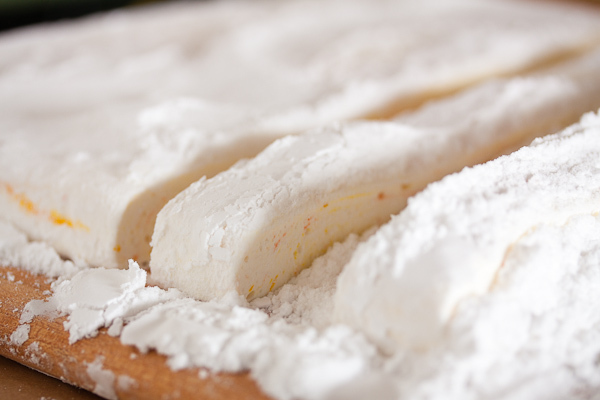 Meyer Lemon Marshmallows | wanna come with? I’ve mentioned before that I’m not a fan of sugary things, and that includes marshmallows. But I am a fan of trying new recipes. When a friend of mine was raving about some homemade marshmallows she tried from a local bakery, I was intrigued. I didn’t even know you could make marshmallows at home! So I looked up some recipes and gave it a shot. 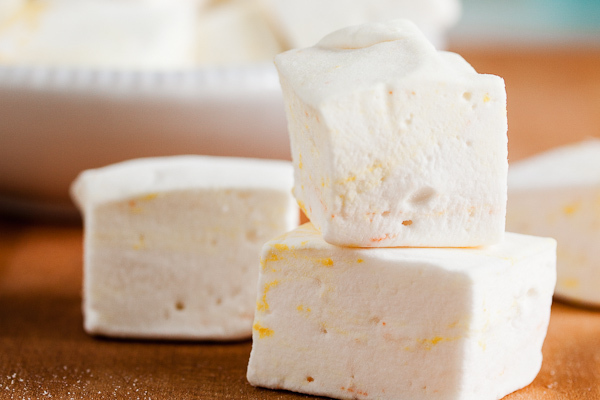 Oh my, homemade marshmallows are nothing like store-bought. They’re so light and fluffy. Yes, generally too sugary for my taste, but I’ve experimented with different flavours over the years and I’ve definitely indulged in more than a few of them. Especially dipped in chocolate. 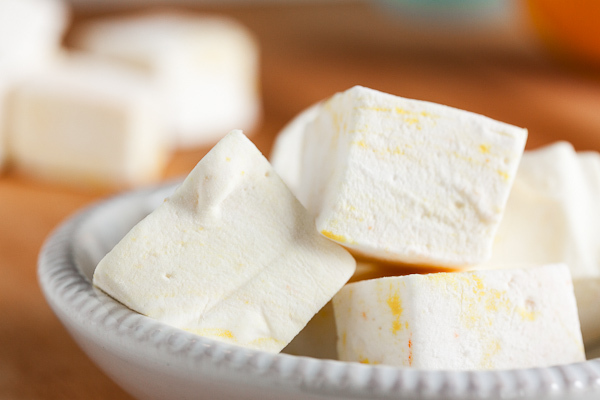 I was actually planning to make plain lemon marshmallows this week, but I stopped at Whole Foods the other day and they had some absolutely gorgeous meyer lemons. If you don’t know what they are, they’re a cross between a lemon and an orange. They look like lemons, but their skin is more of an orange-y colour. 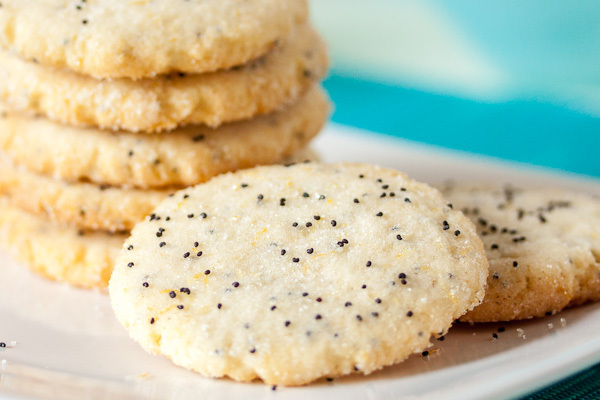 And while they definitely taste like lemon, they’re sweeter. And so my plan to make lemon marshmallows changed just slightly. The first recipe I tried when I made my own marshmallows was from Peter Greweling’s Chocolates and Confections. I’ve always had success with this recipe so I’ve never bothered trying any others. But because that one calls for an unusual ingredient, for this post I decided to try his slightly more dumbed down version of the recipe from Chocolates and Confections at Home. The only real difference between the two recipes is that the At Home version skips the invert sugar and adjusts the amounts of the honey and corn syrup. I think I actually like the texture of this one even better. This may be my new go-to recipe. I’ve played around with different flavours with Greweling’s recipe before, but I hadn’t tried lemon yet. I read a few different recipes online and decided to try just replacing the water that the gelatin is bloomed in with fresh squeezed lemon juice. I also added lemon zest at the mixing stage, but when I cleaned up afterwards I found the zest all stuck to the whisk attachment; so I don’t think any of it ended up in the marshmallows themselves. Oh well. I’ve seen other recipes where the zest is added to the sugar at the cooking stage, but I was worried about burning it since it cooks to such a high temperature. Regardless, I’m very happy with the way these turned out. The lemon flavour is really pronounced (which I love) – even with all the sugar from the marshmallows, some of the tartness of the lemon still comes through. I think they taste like a lemon meringue pie. One of my coworkers declared the flavour “ambrosia”. If you want something a little more subtle, you could probably cut the amount of lemon juice and make up the difference with water, but I’d recommend trying them full strength first. At some point in the future I’ll definitely try these with regular lemons too. I’ll play around with adding the zest at a different stage as well. 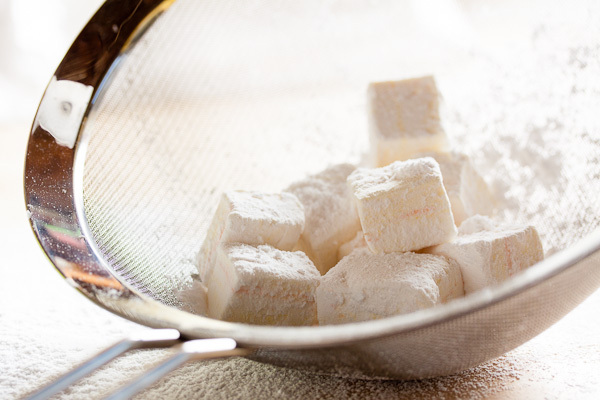 If you’ve never made marshmallows before, don’t be afraid! It’s really not difficult at all. Just be very careful with the hot sugar. There’s a great discussion over at eGullet (36 pages and counting) about making homemade marshmallows. There are tons of tips and tricks and links to different recipes. I got a lot of great advice from there when I first started making them. 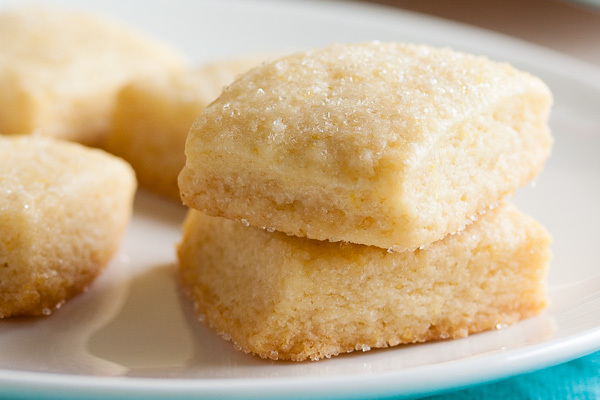 Because these are pretty much pure sugar, they’re incredibly sticky. 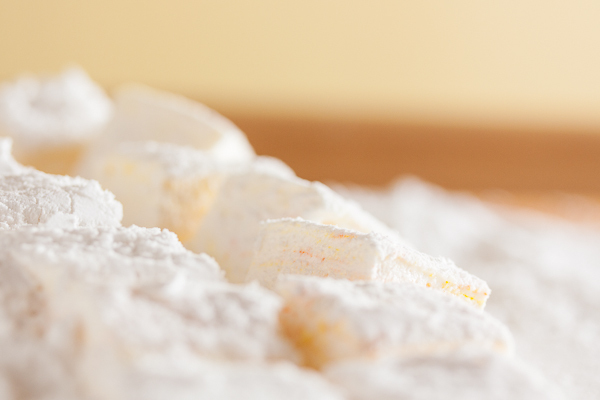 To prevent the finished marshmallows from sticking to everything in sight, you’ll want to coat them with a mixture of powdered sugar and starch. I’ve read that potato starch (if you can find it) is the best option for keeping the stickiness in check, but cornstarch will work fine too. I haven’t tried it personally, but rice starch is another option. 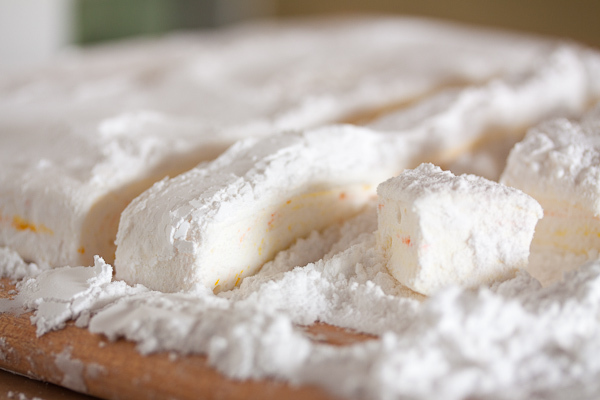 All the recipes I’ve seen recommend cutting the finished marshmallows with a well-oiled pizza cutter or scissors. I struggled with this method for a long time and personally found it to be a sticky mess. I was constantly having to stop and wash and re-oil the cutter, and the marshmallow pieces were sticking to everything. I always dreaded the cutting process. Then one day I read about a different technique, tried it, and have never looked back. 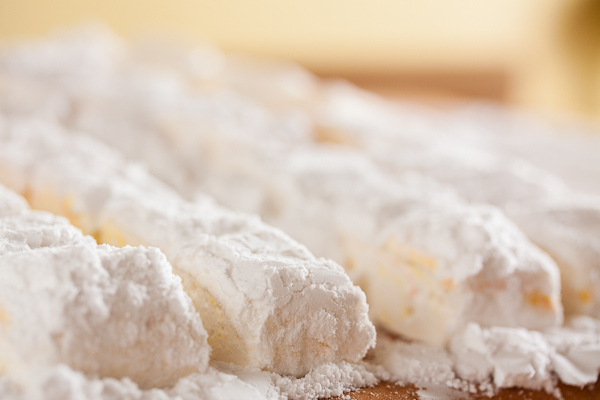 Skip the oil and just use a liberal amount of the powdered sugar/starch mixture. What I do is spoon a layer of the starch mixture on top of my cooled slab of marshmallows, cover it with a cutting board and gently turn it over so I can coat the other side as well. Again, liberally. I’m talking about a quarter inch or more thick layer over the whole slab and spilling over the sides. I use a sharp chef’s knife the same length as the slab so I can slice right through in one smooth motion. The first cut will stick a bit, but there is such an excess of starch mixture both top and bottom of the slab that enough of it will coat the knife to prevent future sticking, and transfer to the marshmallow edges as they’re cut. I’ll also make sure to spread the piles of starch around to cover the cut edges as I go. Then I transfer the cut marshmallow squares to my bowl of starch mixture and toss them til they’re well coated, then transfer them to a sieve where I shake off the excess. I know it sounds like a mess and you’d think there’d be powdered sugar everywhere, but it’s not! I put down parchment paper on my work surface so clean-up afterwards is really simple. I just pick up the parchment and pour all the starch mixture back into a bag to save for the next batch of marshmallows. Parchment paper is your friend. Adapted from Peter Greweling's Chocolates and Confections at Home. 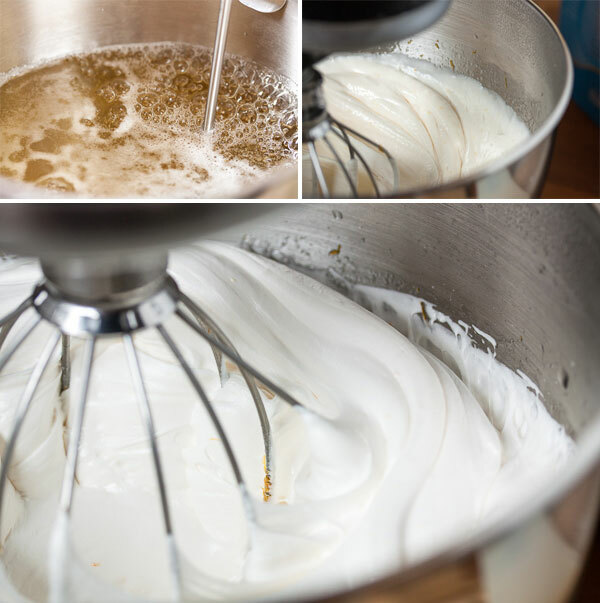 You'll need a heavy-duty stand mixer for this recipe – the sugar needs to whip at high speed for at least 6 minutes to turn it into marshmallow fluff. Note: when cooking sugar, subtract 2°F from the target temperature for every 1000 ft above sea level. Depending on how big you want your finished marshmallows to be, you can make these with anything from an 9" x 9" pan to a 9" x 13" pan. The original recipe specified 9" x 9", but I like mine bite-sized and they ended up being about 1" thick using 9" x 13". 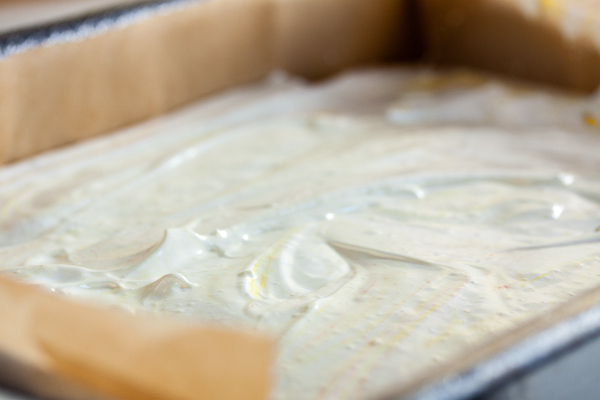 Prepare your pan by lining it with parchment paper, then lightly oiling the parchment with a flavourless vegetable oil (not olive – it has too strong a flavour on its own). I pour a little dollop of oil right into the pan and then use a pastry brush to spread it around. You could just oil the pan directly, but I find the parchment paper makes it easier to lift the marshmallows out of the pan at the end. Combine the gelatin and lemon juice in a small non-reactive bowl or the top of a double-boiler. You will eventually heat this gently over simmering water, but not yet. Set aside. Combine the sugar, corn syrup, honey and water in a 2 quart saucepan and attach your candy thermometer. Cook over medium heat until the sugar has melted. Using a pastry brush dipped in cold water, brush down the sides of the pot to ensure all sugar crystals are melted. Increase to medium high and bring to a boil. Continue to cook until it reaches 252°F. Carefully pour the hot sugar into the bowl of your stand mixer, pouring down the side of the bowl so it doesn't splash up. Seriously, I can't stress this enough – this sugar is extremely hot, so be careful. Insert your thermometer and let stand and cool until it reaches about 210°F, about 10 minutes. While the sugar is cooling, melt the gelatin over a pot of simmering water on low heat. Many recipes instruct to just add the gelatin as-is to the hot sugar. I've read, however, that gelatin can lose its setting ability if it's overheated, which is why we're currently allowing the sugar to cool somewhat (I didn't make this step up – this is straight from Greweling's recipe). And melting the gelatin now will help it incorporate more smoothly. Once the sugar has cooled, slowly pour the gelatin into the bowl, down the side the same as we did with the sugar – otherwise the sugar could splash up. Gradually turn the mixer from the lowest speed to the highest – again, we want to do this gradually so the molten sugar doesn't splash. I let it run for a few seconds at each speed before increasing. Use your best judgment here. Once you reach the highest speed, continue to whip for 6-10 minutes. The longer you whip it, the more air is incorporated and the lighter and fluffier it gets. However, the longer you whip, the stiffer it gets and the more difficult it is to pour into your pan. So there's a trade-off. I usually whip for about 8 minutes. They're plenty fluffy, and still soft enough that it's not impossible to smooth out. If you want to add food colouring, you can add a few drops just before it finishes mixing, or you can add it after you've turned off the mixer and just gently swirl it through with your spatula to get ribbons of colour throughout. Just a few drops will give you a nice pastel colour. Pour the marshmallow into your prepared pan – you will need to use a spatula to scrape it out of the bowl and level it out somewhat. I like having a few whorls and ridges showing on the surface so people know these are homemade. If you want a perfectly smooth top, you can level it out with an offset spatula lightly coated with oil, or an oiled piece of parchment. You'll need to work pretty fast because the marshmallows begin to set up really quickly after removing from the mixer. Allow to sit for at least a couple hours, preferably overnight, before cutting. 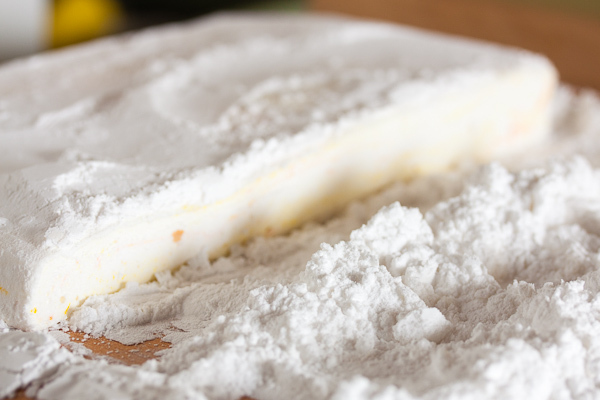 Sift together the confectioner's sugar and the starch. You won't end up using all of this, but the remainder can be saved and re-used next time you want to make marshmallows. Having more than you need makes the process easier though. You can cut these using an oiled pizza cutter, knife, or pair of scissors. But I find this method messy. See my instructions here for my preferred method to cut them. It's way easier! These should keep for several weeks at room temperature. You'll know they're reaching the end of their life when the texture starts to get a bit grainy – this is just the sugar re-crystalizing. But honestly, you won't have any left that long! 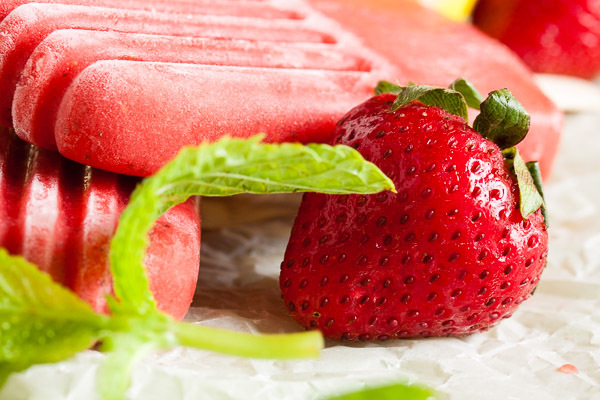 Whatever you do, do not store these in the fridge. Sugar absorbs moisture and they'll just get sticky. We are sort of opposites, in that I’ve never met a sugary treat I didn’t like, but we do have some common ground: our love of homemade marshmallows! 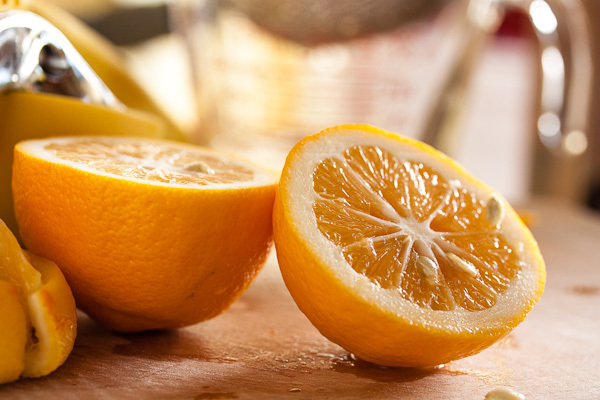 And lemon seems like the perfect way to cut the sweetness while adding amazing flavor. [Slight derail: could you stir the zest in by hand at the very end, after they’re fully whipped? Seems like that might work well?) And I love the Greweling books–haven’t tried his marshmallows but all of the recipes I have tried are super solid. You always recommend the best cookbooks! I can’t recommend Greweling’s books enough. I’ve tried several recipes from both, and they’ve all been fantastic. I love all the detailed info he gives on techniques and the reasons for doing things a certain way. How did I not know about your blog before now?! I found you yesterday and have been combing through your recipes ever since. These though! THESE, I just made, only with limes from our backyard tree and a swirl of green food coloring and they’re beautiful and amazing. I may just sit here for the rest of the day eating lime marshmallows and coveting recipes to make in the coming weeks. I made the peppermint ones today for about the eleventy hundredth time and they are just as good as they always are. And, I also just looked through recipes for homemade marshmallows on the web just to see what others are doing and I am shocked at how awful the recipes and descriptions are. If one were to do what some of those recipes suggest, things might not turn out well at all! Once again, I am so impressed with your site, your lovely pictures and your well thought out recipes. Thank you! As much as I’d love to accept credit for the recipe, all credit has to go to Peter Greweling of the Culinary Institute of America and his book Chocolates and Confections (props!). And I must admit, this is the only marshmallow recipe I’ve tried so far. I do have plans to try some others, especially one that includes egg whites (I’m intrigued). But this recipe has never let me down, so I’ve been hesitant to experiment with anything else. And after learning Chef Greweling’s techniques and reasons for doing things a certain way, I can’t help but nitpick other recipes and want to tweak them back to what I KNOW works. Hello, I made these marshmallows 2 days ago, I cut them in squares and they are not squares anymore, but tend to :desínflate” a little. How can I keep them solid squares? I tried your recipe today and I am so impressed with the silky firm texture of these marshmallows compared to another recipe I used recently!! I put the lemon zest and sugar into a food processor to get it very fine and had no problem with the zest burning at the high temperature. Also – thanks for the tip on cutting the marshmallows; it was sooooo much easier! I’m so glad to hear these worked out for you Irene! I keep meaning to try a different recipe, maybe one that includes egg whites, but I’ve gotten such good results with this one I just keep doing variations. Maybe one day ?